At first glance, you would be forgiven for mistaking this cityscape with its cluster of tall towers for Los Angeles, Houston, Dubai, or even Shanghai or any one of those other fast-growing Asian cities – but this is in fact London with Spitalfields in the foreground. All the buildings in white are new or yet to be built. 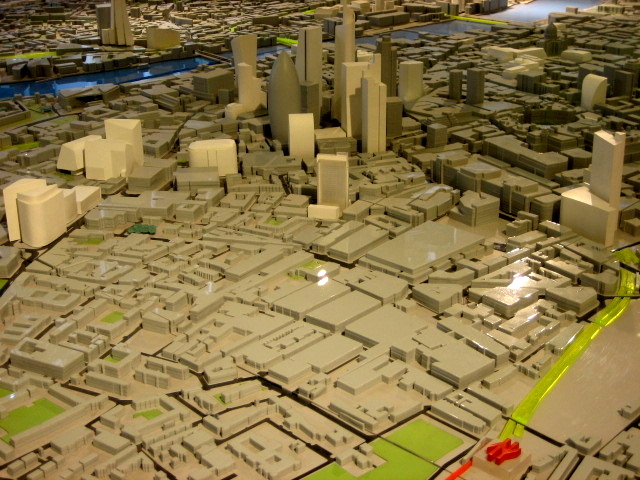 This prophetic vision was revealed to me when I visited the New London Architecture exhibition at The Building Centre off Tottenham Court Road last week, where The Pipers Central London Model is on permanent display. It is made to a scale of 1:1500 and every building is there – I wondered to see my own home reduced to a tiny grey plastic cube the size of a Monopoly house. Though, strangely, the Spitalfields Market development appears not to have happened yet and the spire of Nicholas Hawksmoor’s Christ Church has been lopped off. If you want to know more about future developments including Crossrail, go and take a look for yourself at The Building Centre or, alternatively, keep your eyes on the skyline, because it is going to change.